The St Louis Cardinals "birds on bat" have been a venerated visual staple for the team since they were introduced in 1922. Over the years they have been updated on occasion—around a dozen subtle variations have evolved into today's Cardinals birds, about to hit the field for their 19th World Series. 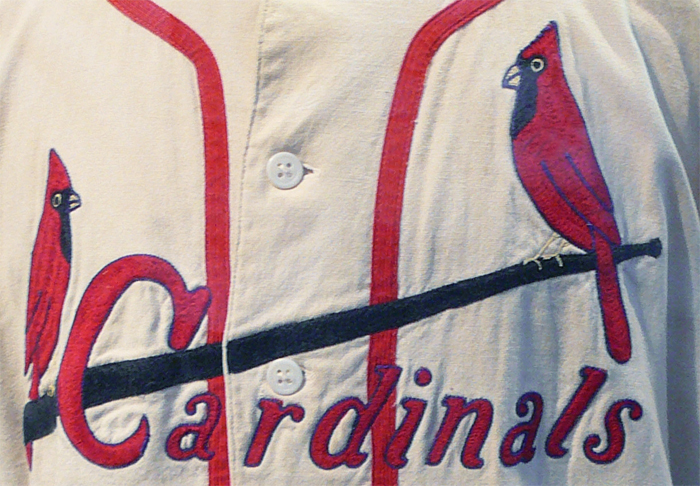 The Cardinals were a team in organization transition by the end of the 1940s. Like many MLB clubs, they opted to "professionalize" their branding at this time, seeking to capitalize on the post-World War II economic boom. Interestingly, the Cardinals again revised their birds only two years later; this variation would take them up to 1955. The following season the club eliminated the birds entirely, opting for a script "Cardinals," a change which lasted but one season—and another story for another time.